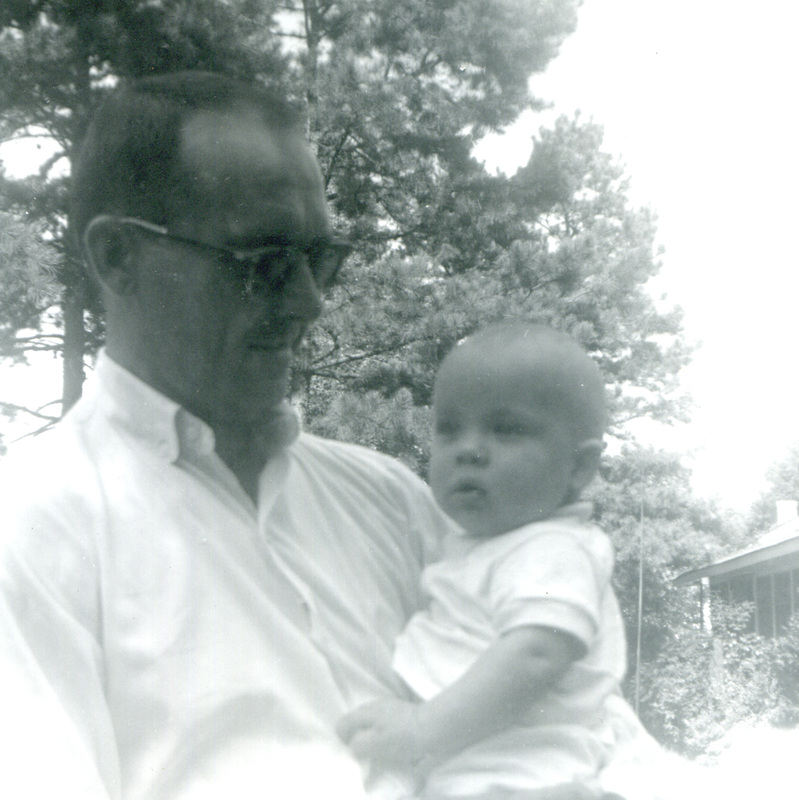 Uncle Bub was born 23 July 1922 in Charlotte, North Carolina, the second child of Andrew Hamilton Rohleder (1900-1974) and Myrtle Odessa Primm (1897-1959). Andrew worked at a cotton warehouse, where he supervised people who sorted cotton that came in from area farms and bundled it to be shipped out to the cotton mills. The warehouse was in downtown Charlotte next to the rail yard. Andrew liked to take his sons down to the warehouse and climb up on the roof for a view of the city. A few months after Bub’s fifth birthday, his brother Jack Carlton was born. When the Depression hit, Andrew lost his job at the warehouse and started selling insurance. When Bub was around 13 years old, the family moved to Rockingham where Andrew had a job in another cotton warehouse. They bought a little house on Leak Street and settled in. Bub worked for a while for the North Carolina Ship Building Company in Wilmington, North Carolina. The company was in business from 1941 through 1946 and built ships for the war effort. Bub enlisted in the Army in October 1942, reporting to Fort Bragg, North Carolina. He did some training at Camp Breckenridge in Kentucky before being sent to Hawaii. One of the highlights of his time in Hawaii was when Bub’s brother Andy flew to the base to visit him. He sent back lots of pictures along with his letter describing the event (you can read the letter here. After the war, Bub was part of the occupation forces in Japan, and received an honorable discharge in January 1946. With the war over, Bub returned to Rockingham. He got a job with McLean Trucking, running long hauls from Maine to Florida. But in the early 1950s, he met a girl. He married Gladys Lucille Conyers (1931-2002) on 6 April 1952 in Bennettsville, South Carolina. Now with a reason to be home each night, Bub started working for Standard Trucking, which had local runs that got him home most nights. He loved driving and was very proud of the way he kept the truck. He would drive the cab home on weekends and wash and wax it. I remember visiting the house when Uncle Bub had the cab home cleaning it. He’d let us get in and look around. Uncle Bub with his first child. Uncle Bub and Aunt Gladys had two children and lived in Rockingham their entire married life. People remember him as a funny guy, always cracking a joke or pulling a funny line out of a conversation. He played the piano by ear, a talent I envied. He was the tallest of the Rohleder boys. In late December 1969 Uncle Bub was doing some home improvement work around the house, mainly some painting. His arm hurt from using the paint roller, but he pressed on. However, something happened that made him go to the emergency room early in the day on New Year’s Eve. While he was waiting on the doctor to see him, joking with the nurses, he had a massive heart attack and died. He was only 47 years old. His doctor was bereft that he couldn’t save Uncle Bub (they were friends from church). The funeral was the following day. I couldn’t bring myself to go, so I stayed with some cousins. Uncle Mac was born on 8 July 1925 in Cordova, North Carolina, the eldest child of Frank Ledbetter McKenzie (1902-1970) and Annie Jeanette Reynolds (1902-1987). Cordova is a little mill town in Richmond County. Almost everyone in the neighborhood worked for one of the mills, and there were a lot of children. During the Depression, Ledbetter worked at the mill store (run by Ledbetter’s brother Jim). Often times payment for work came as food for the table, so the family didn’t notice food shortages like some did during those times. Graduating from high school in 1943, Uncle Mac joined the Air Force and as a radio operator flew in missions over Europe. His plane was shot down in enemy territory, but with the help of some local friendlies, he managed to get to safety. After the war, Mac enrolled in the Engineering department at North Carolina State University. He went to work for Pneumafil Corp. in Charlotte and retired from that company as Vice President of Engineering. 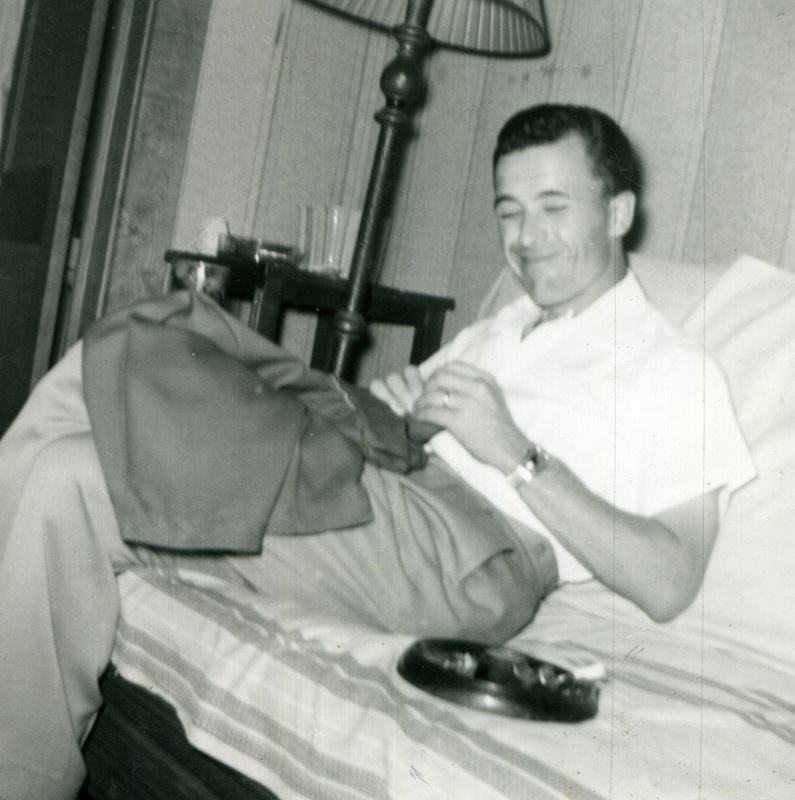 Uncle Mac mending a pair of pants. After moving to Charlotte, Mac met a girl! He and Betty got married and had two children. He taught his children how to play baseball and how to fish. He did the crossword puzzle in ink, never needing a redo. And just when the kids thought there was no Santa, Mac sent “Ho Ho Ho” down the heat duct and threw shoes on the roof just to prove them wrong. 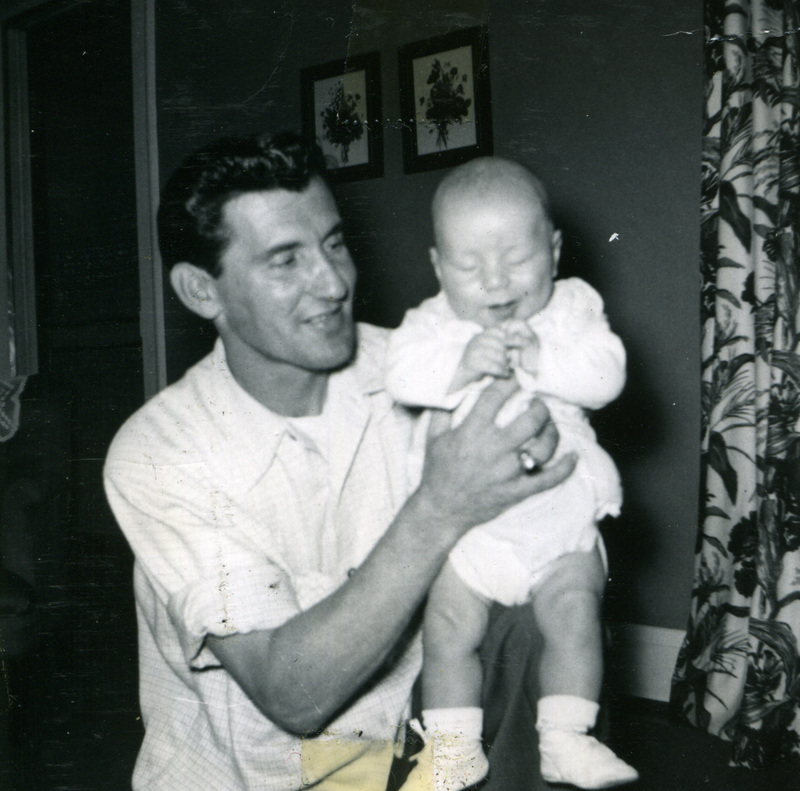 By the time Uncle Mac was diagnosed with Parkinson’s disease, I had moved out west and didn’t see him often. On one visit back east, I remember him sitting in his wheelchair, laughing and telling jokes. A few years later, after the Alzheimer’s had hit, he was still laughing and joking, but he had lost about half of himself in weight. The last five years of his life he was in hospice care. He mainly stayed at home and the caregivers came to him, but he maintained his sense of humor despite his failing health. On 20 December 2008, Uncle Mac died at home with his family. Uncle Benny was born 24 October 1929 in Richmond County, North Carolina, the youngest of Ledbetter and Annie McKenzie’s three children. 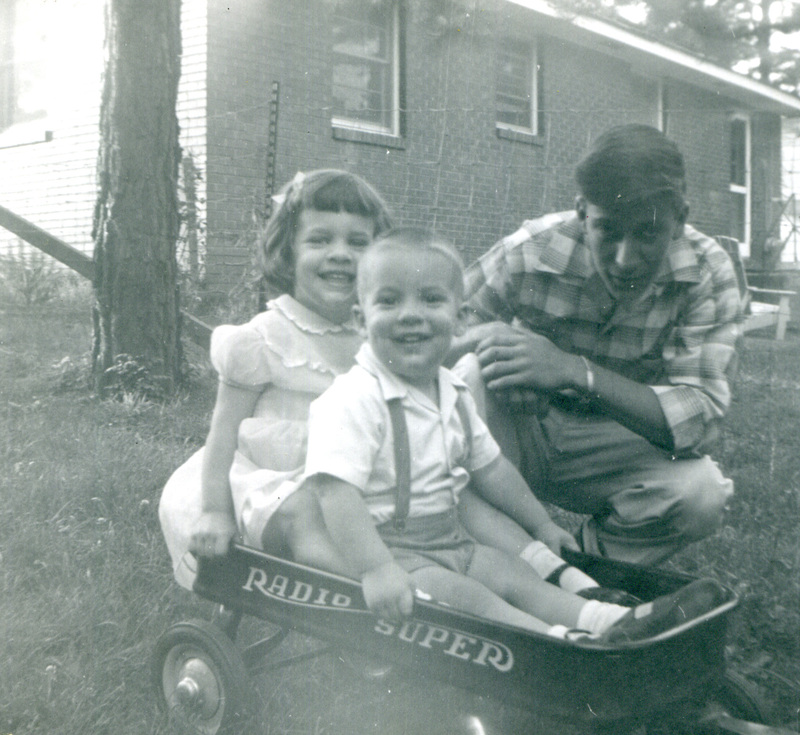 He grew up in the mill town of Cordova, playing with all the children in the neighborhood. The most extroverted of the three siblings, Benton had lots of friends. He played trumpet in the high school band, and in his sophomore year played taps at a special service held at the high school for President Roosevelt. After high school, Benton enrolled in Davidson College where he studied for a couple of years. Money could be the reason Uncle Benny left college and joined the Air Force. He served from January 1951 to January 1955 in Illinois, Wyoming, Texas, and Germany. While he was in Germany he took some leave to visit the Middle East. That overseas deployment yielded several gifts for the family: a couple of camel seats for his parents, a pair of earrings for his sister (my mother), a German-made wooden truck for his nephew (my brother), and a German doll for me (I still have it). I expect there was a gift for his brother as well. Uncle Benny with his first child. After his discharge from the Air Force, Uncle Benny continued his education at North Carolina State University in Raleigh graduating with a degree in forestry in 1958. He headed to Georgia to start his career, and he met a girl! Benton married Sue Banks Franklin (1933-2008) on 27 September 1958 in Rome, Georgia. They had two sons. Most of his adult life was spent in Rome with a short stint in Swainsboro. In the late 1970s Uncle Benny was diagnosed with cancer and nearly died. The doctors said had he not been in such good physical shape he probably would have. But survive he did, minus a few parts, and lived a full life after that. He enjoyed playing golf, and was an active member of the Rome First Methodist Church. Sue died in 2008 just two days after their 50th wedding anniversary. Uncle Benny died on 1 February 2014 in Rome, Georgia. Bill Bill with my brother and me. Uncle Bill, or “Bill Bill” as I called him when I was little, is still alive and kicking. Like his brothers, he played sports in high school, including baseball and football. He pitched and played outfield, and was on the team that won the state championship his junior year. His football playing won him the blocking trophy his senior year, the same year the team had a perfect regular season. I remember visiting when I was little and Bill Bill taking me to the soda shop to see Pat and get some ice cream. I was stationed on an aircraft carrier in the Pacific ocean and we were selected to be the primary recovery ship for the Apollo 8 space capsule. Apollo 8 was the first manned mission to go around the dark side of the moon. It was an early dawn splashdown and the TV camera on the flight deck had nothing to see or talk about, so the TV network journalist came to me in the hanger deck (the deck below the flight deck) and asked me to inspect my Marines as there was nothing going on for the next few minutes and we were on live nation-wide TV. So I went down the line, did a rifle inspection, twirling each rifle, inspected it and returned it. Meanwhile (Pat told me this later) the kids were watching the event and screamed at their mother, “Come look, Daddy is on television!” So my claim to fame is I was on nationwide TV for about 3-5 minutes before splashdown of Apollo 8! Uncle Bill retired from the Marine Corps and worked for defense contractors until Pat died. He then retired completely, and eventually married again. Now he spends his time being a dad and granddad, and volunteering with the local Marine veterans association. Uncle Bill has been collecting things for most of his life. He started with coins, has an entire wall of beer cans, and has memorabilia from his brother Andy. He asked me if he was my favorite uncle. Well, of course he is; he’s the only one I have left! This entry was posted in 52Ancestors, McKenzie, Primm, Reynolds, Rohleder. Bookmark the permalink.